is the countersink of choice for finish work. accommodate wood screw sizes #5 to #14.
the hand drill, portable electric drill, and drill press. 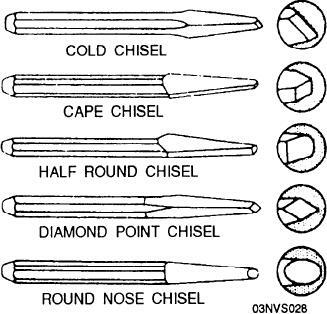 Figure 5-23.--Types of points on the metal-cutting chisel. lessen the shock to your hand. cape, round nose, and diamond point (fig. 5-23). precautions is before you start the job. mushrooming and creates a very dangerous situation. to remove this dangerous situation.